The Fountain Valley School District (FVSD) welcomed a new member to its family with the appointment of Molly Kuykendall to the position of Assistant Principal at Talbert Middle School. 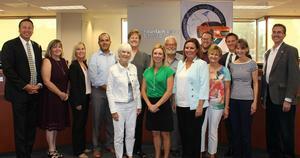 The Board of Trustees approved Ms. Kuykendall at their regular Board meeting this evening. Ms. Kuykendall joins the FVSD Family from Norwalk-La Mirada Unified School District where she served as Dean of Students at Corvallis Middle School. Prior to this, she taught in Palos Verdes Peninsula Unified School District and Torrance Unified School District. Ms. Kuykendall received her Master of Arts in Curriculum and Instruction from Cal Poly San Luis Obispo and her Bachelor of Arts from the University of San Diego. In addition to her commitment to education, Ms. Kuykendall is an avid reader and a huge sports fan. She enjoys cheering on the UCLA Bruins and the Los Angeles Dodgers. The Fountain Valley School District, founded in 1898, is comprised of 10 schools serving nearly 6,400 students from Fountain Valley and Huntington Beach. Fountain Valley School District seeks to promote a foundation for academic excellence, mastery of basic skills, responsible citizenship, and a desire by students to achieve their highest potential through a partnership with home and community. To learn more about the Fountain Valley School District, visit our website at www.fvsd.us or follow us on Facebook at https://www.facebook.com/fountainvalleyschooldistrict.